During the project I’m working to create architectural visualization in Unreal Engine 4, I came up with some ideas to improve workflow when creating objects in blender for export to Unreal Engine 4. Now it is time to release it to the public (Free! ), So I hope the addon will help more people like it helps me now! ��� """A Custom Panel in the Viewport Toolbar"""
��� bl_label = "UE Tools"
With Scene Tools, you can easily set the scale of the scene and objects and the pivot points for the collision meshes. Set UE Scale: If you press this button, The scene will change to be in centimeters with all necessary parameters configured to not have problems with the camera. Scale Selected Objects: If you have this box checked, by pressing the “Set UE Scale” button, the Scale will be configured correctly also for the selected objects. Set Collision Pivots: By pressing this button, is posible to set up the pivot point for multiple collision meshes in 1 click. So we can see that, by rename the collision meshes with the corresponding Prefix (UCX) and suffix (in case of multiple meshes), you will assign the collisions to a particular object. Base name: Here you can choose the basis for the name that will be used for rename, You have several options. Use a custom name (this option is used to rename objects collision), use the name of the selected objects, use the object data name of the selected objects, or use the name of the first material (this last option is not used but as the code base that I utilize include this option, I have also decided to include in this addon. Prefix: In this section you can define a prefix to add to the base name, when you rename the objects. If you check the “Collider” box, automatically the “UCX_” prefix will be added, plus a numeric suffix supported in Unreal engine (Blender adds suffixes in this format .000, .001 etc. .. Unreal Engine need in that other _000 , _001, to detect collision objects). You can also check the “Custom Prefix” box if you want to add a custom prefix. In this case, no suffix is ??added. And finally, you can choose in which data type the prefix will be added. Export Character: For use this feature you must select the mesh/meshes and then your armature so the armature will be the active object. When is pressed will export the character mesh and the armature , but only will export the bones that are defined as a “DeformBones”. On the animation tools video you can see how to do it with the addon tools and below you will find more info. Available Actions: This panel is for create and remove actions, is visible also in pose mode. When you press the button for create a new action , a pop up will ask for a name of the action, will set up the new action to active action and set the user to Fake user. when new action is created , a new button appear on the actions panel with the name of the action , press the action button at any moment for change the active action. Also you will see a button for remove the action. Auto Creation:� This option will create the group and will scan all the bones to see the bones that deform the geometry, if some does, will add the bone to the group. Export Collision: Self Explanatory. If you have some collision meshes assigned to the objects selected when you hit the export button, will be exported the collision meshes along the selected objects. In this update I remove the check box for export with or without smoothing shading,The new blender version export take into the account the normals of the faces by default , so is fine , if you have flat shading in some faces and smooth in others , will export correctly. The new Blender version also have an option for bake the animation in all bones, this is good because avoid a big problem with the locations of the bones, I show this problem on the animation tools video some days ago and how I deal with that but we don’t need to do anymore. Also I made a change on the workflow for export animations and characters. I remove the pop ups asking for rotate 180� because I found I don’t need anymore. I append the Hero (so facing -y) and I just press export character and the same for the animations. I do some test with the hero and with MakeHuman rigs and work fine. If you find you need rotate 180� the character for some reason let me know , the code is on the addon , just commented, so ignored. During the viewing of some TeslaDev streams, I needed to create an animation for the blue guy and complete the prototype as I wanted. That led to some new features for the addon . 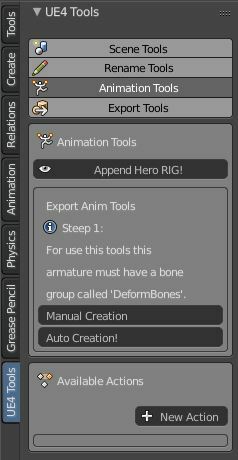 Basically At first it was for quickly have a friendly skeleton for animation and compatible with animations that comes standard with the Unreal engine (the hero/blue guy), but in the end I thought it would be useful that these tools serve me for another kind of Rigs, especially those who I could create in the future, if I need something specific.